It could have been much worse, but the Olentangy Liberty football team hung in there and kept it close. Ultimately, though, Huber Heights Wayne came into Powell and handed the Patriots a 17-0 defeat Friday night. Wayne (1-1), showing no ill effects from the short week (coming off a game Sunday), used a 22-play drive to go 72 yards, picking up four third downs and a fourth down along the way. But, Liberty’s defense stood tall and held Wayne to a Garrett Russell 24-yard field goal with 2:39 left in the first quarter. Nate Collins recovered an Antwuan Johnson fumble at the Liberty 23, which led to a Zarik Brown touchdown from 18 yards out two plays later to give Wayne a 10-0 lead with 7:45 left in the half. Quarterback Rashad McKee found Austin Mullins from 6 yards out to cap the scoring for Wayne. Wayne also turned it over on downs in the red zone and missed a 38-yard field to end the half or it could have been worse than it was. The Patriots struggled to move the ball on offense, held to one first down in the first half, which came on a personal foul penalty. Alex Reigelsperger, a Kentucky commit, led the Wayne defense with 3 sacks in the first half to keep Liberty behind the chains. Liberty (1-1) moved the ball into Wayne territory three times in the second half, but couldn’t get inside the Wayne 40. The best scoring chance was when Brown was stopped at the Wayne 1 and was pushed back in the end zone late in the third quarter. Wayne ended up punting on the possession. Wayne dropped its first regular season game since Oct. 31, 2014 with a 41-0 loss at Pine-Richland (PA) to open the year Sunday. 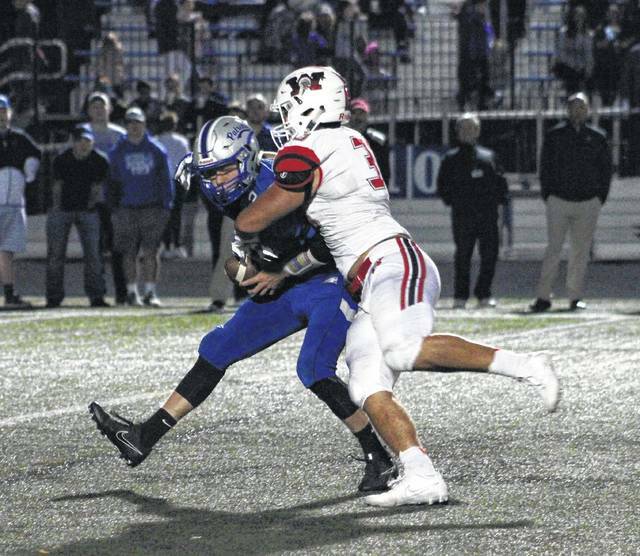 Next up, Liberty travels to Marysville Friday night at 7 p.m.
Wayne defensive lineman Alex Reigelsperger sacks Liberty quarterback Mitchell Okuley during the first half of Friday’s non-league game in Powell.